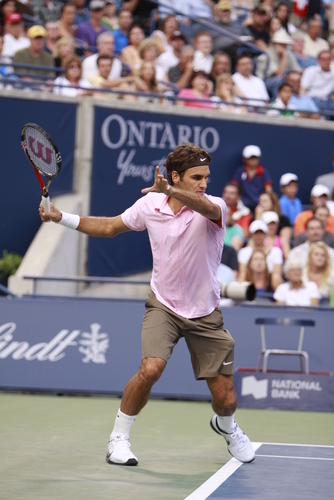 The split step should occur each and every time your opponents racquet begins moving toward their point of contact. By splitting you will not only get to as many balls as possible but also be in the proper position to initiate the correct technique for every shot. Prior to splitting you will need to be in motion as the split should be plyometric, explosive! You can either “do a little dance” by alternating your feet with little steps in place or you can do "mini” splits until it is time for the “big” split. Remember to keep your feet apart greater than your shoulder width and land with the majority of your weight toward the front of each foot (not on your heals). Maintain your “tennis posture”, knees bent, not your waist, and shoulders relaxed when landing. Have fun and split often! Have you ever been playing a match and thought to yourself, "wow, I am getting tired faster than usual, maybe very sore from matches the day before, or just don't feel right etc.?" I thought I would change it up a little bit this week and talk about how nutrition can have a positive impact, or even negative impact on your performance. I believe proper nutrition is something everyone can do, no matter what your skill level is. In particular, carbohydrates are key to boosting physiological and psychological performance. They can also be very important in maximizing training level, endurance and recovery. In a statement from the International Olympic Committee (IOC) on nutrition for athletes, it was stated: "A high carbohydrate diet in the days before competition will help enhance performance, particularly when exercise lasts longer than about 60 min and athletes should aim to achieve carbohydrate intakes that meet the fuel requirements of their training programs and also adequately replace their carbohydrate stores during recovery between training sessions and competition" (Jeukendrup, 2004). "Other research studies have shown that ingesting carbohydrates during prolonged exercise results in a reversal of fatigue" (Coggan et al, 1991; Coyle, 1995; Coyle et al, 1983). It is also important to understand that your brain uses carbohydrates to function efficiently. Carbohydrates are broken down into glycogen and glucose. At rest, your brain uses more glucose than any other organ. If you are training for 1 hour a day: 3 grams of carbohydrates per pound of body weight. If you are training for 2 hours a day: 3.6 grams of carbohydrates per pound of body weight. If you are training for 3 hours a day: 5 grams of carbohydrates per pound of body weight. If you are 150lbs and training for three hours, that means you should be consuming 750 grams of carbohydrates. Preferably this consumption should happen 2 to 3 hours prior to playing your match or practice. This will vary from person to person. It is also important to remember that this "750 grams" is separate from the carbohydrates in your regular diet. Ingesting healthy carbohydrates BEFORE the match is the most effective. However, during a match the classic banana usually does the trick. It is also important to drink plenty of water, and if a sports drink is desired my personal preference is Pedialyte. One thing that I feel is important is that this is more of a lifestyle change then a diet. For this to most effective, it must be a daily routine. This will be less effective if done sporadically. Lastly, I encourage you to personalize this and any other performance enhancing nutritional needs, so that you are 100% aware of what does and does not work for you. Proper nutrition truly could be the difference between winning and losing a match. Here is a good list of healthy carbs to consume. There are many others. Today I have a quick tip for you, but an important one. I believe that the split step is highly underappreciated and neglected. I think the reason for this is because we are just hopping (which takes too much time) instead of split stepping. Go ahead and get on a scale where you would normally weigh yourself, and bend your knees as fast as you can. You'll notice that the scale will go down before it goes up. In tennis we call this "unweighting." When you land on your split step think about unweighting one half of your body, in order to transfer your weight into one leg or the other before you take your first step to the ball. You don't want to land directly on both because then you will have initiate the unweighting process after you land instead of going straight into it on the landing phase. This will allow you to free up the other side of your body so you can start to build your momentum with every step. Think about starting your movement to the ball before the "scale" has a chance to bounce back and make the weight go back up. If done properly you will move more efficiently and be able to retrieve more shots. To this day nobody has explained the return of serve better than when Nick Bollettieri said “Well, if a guy hits a ball 120 -135 mph, it is going to be a very hard serve for anybody to return. I think that probably the most effective way to handle a big, flat 130 mph serve is to simply say, Our Father, who art in Heaven, hallowed be thy name, and take your chances.” Not only do I personally find this hilarious, I also believe there is some truth to what Nick is saying. If you’re human, it is impossible to cover the entire tennis court, especially on the return of serve. If you think you should get to every single ball, you are only putting unneccesary mental stess on yourself. However, there are ways to cover the court well, and maximize your chances of getting to the ball while at the same time, accurately getting the ball to where you want it to go. 1. How you lift off on the return will have an impact on how well you get to the ball. 2. How you land off your split step will impact how well you are able to get to a ball. 3. How fast you react after landing will affect your success in retrieving the ball. 4. This is “reactive and adaptive” as opposed to anticipation. 5. Perfecting your split step is crucial to having not only a good return of serve, but also retrieving all shots landing on your side of the court. There are way too many technical aspects in regards to the service motion to fit into one post, so today I hope to give you some valuable tips on how to stop or minimize the amount of service errors you make in the net. Remember, everybody is going to make errors in tennis, so the key is to constantly be making adjustments. Even when you are executing your shots properly and they are landing inside the court, you should still be m...aking minor tweaks and adjustments. Unless you’re like me and have never missed a shot in your life. True story, I have never missed a ball to this day. #1. Keep your head up until after you contact the ball. Bringing the head down too early is probably the most common reason players hit the net on the serve. Even pro players need to remind themselves of this time to time. #2. Don’t pull down your non-hitting arm too early. Your arms should work together on the serve. If you are yanking your arm down to early, this will pull your other shoulder up and push your head down. #3. Contacting the ball too far out in front. A very common adjustment players will make is to slow down the speed of their serve. This is a big “no-no.” What you should be doing instead is adjusting your contact point. Don’t toss it so far out in the court. (If you would like me to explain why some pros are way in the court I can definitely elaborate.) Think about the angle of your racket on contact. You don’t want to toss too far behind you either, or you will start to make errors long. #4. Rotate upward instead of sideways. Pulling the elbow down too early off the ball will create a risky trajectory and often take height off the ball. Try to get the shoulders up and over each other, like a windmill. #5. Use your legs. You should be utilizing as much upward weight transfer as you possibly can on your serve. Evaluate which way your momentum is going and adjust it upward. We all know that to play better, we need to be more consistent in all aspects of our game. Shot ability, shot selection, footwork, strategy, focus. It could all use more consistency. So here are four things you may consider as goals to work on this year to get more consistent. Figure out what pace you can hit the ball to where you know it will go in most of the time. This will vary for everyone. Once you know what that pace is, we are going to call that your “Rally Ball.” Start playing and practicing at rally ball speed, only hitting faster on rare occasions. Now, try to improve your rally ball by increasing the pace in practice only 5-10% and see if you can maintain consistency. So if you hit your rally ball at 5 on a scale of 1 being the softest you can hit it and 10 being the hardest, increase to a 6 when you are practicing. I see many players go between a 5 in play, and then a 10 in practice, and they don't ever get more consistent because the 5 remains the same and the 10 will never become consistent enough to depend on. If you practice the 6 long enough, it will eventually become your rally ball and it will feel like your old 5 even though it's actually 10% faster without being less consistent. Figure out how far inside the lines you need to aim to make sure you won't miss most of the time. The closer to the line you aim, the more errors you will have. In addition this gives people with questionable character more opportunity to cheat. Let your accidents be your winners as your aim gets better. Practice more and play less. Play less sets and start doing more drills. Practice one shot at a time over and over to the same location. Use a ball machine or find a partner that is willing to do rally drills that focus on repetition. You can make it into a contest for example, getting 20 in a row cross court, but the concentrated repetition is what's going to make you more consistent rather than playing points. Consider learning spin. If you don't commonly use spin, your consistency may drop for a brief period of time until you get the feel. Within a few practice sessions you should easily be back to your old consistency level with the potential to now go far beyond it. Utilizing spin primarily does two things. First, when you hit with spin, you are taking a fraction of the energy that would normally go into producing pace on the ball and turning it into spin. This effectively slows the ball down allowing you to control depth. If someone is able to hit a lot of pace at you, spin gives you the ability to negate and control their power without altering the speed of your swing that much. Secondly, if you are hitting in particular with topspin, you can aim higher over the net while feeling confident that your shot will drop before the baseline. This helps avoid the two most common causes of errors. Topspin “hooks” down quicker than a ball with no spin thus increasing your potential consistency greatly. Happy New Year and let's have an outstanding 2018!! There are three things you want to memorize and do as soon as the lob goes up off your opponent’s racquet. Turn sideways, racquet back, point. Turning sideways allows you to back up quickly while still maintaining balance. It also sets you up to achieve a proper weight transfer once you are hitting the ball. Getting the racquet back as soon as possible helps with timing. An overhead isn’t like a serve where you get to throw the ball to yourself and thus have time to execute a long rhythmic motion that maximizes racquet speed. Often we might still be moving when it’s time to hit an overhead and the ball could be accelerating down, so we need a quick preparation that allows us to “pull the trigger” at any given moment. Pointing at the ball sets up the shoulders for a proper “see saw” rotational motion which creates a lot of power. Pointing also ensures that you are looking at the ball! Practice those three things so that they all happen together as quickly as possible and you will be on your way to having a great overhead. We all hear about the “big” or crucial points in tennis, but sometimes it’s difficult to fully understand which points these are. Today I would like to share with you precisely what points have the biggest influence on the outcome of each game and ultimately each match. The ATP posts various match statistics on their website, but it is very difficult to decipher how those points are effecting the outcome matches. For exam...ple, someone could be hitting 100 forehand winners (Impressive) but still lose every match. As shown below you can see that being the server in these situations is a huge advantage, and something to really think about. When in these situations, I believe it is important to put more energy and effort into these big points, and conserve energy during other points. Personally, when I broke someone’s serve in singles, I did not put a whole lot of energy into the following return games because I knew that I could win my service games 98% of the time. I knew only needed one break to close out a set. Another tip to track which big points you are personally winning and losing the most of is to have someone chart your matches. During the tennis congress, we showed players a way to do this easily with a simple line graph. You just draw a horizontal line with the paper rotated horizontally, with points that are won going upward and points lost going downward. The lines should be about 1 inch long, and on each point that you make you can put a label or a note. You can customize the way you chart each point however you like. I put a picture below to show you an example. I hope this gives everyone a better understanding of what “big points” really are and gets you thinking about how you deal with them. If you have no idea, I highly recommend you have a friend or teammate chart a couple of your matches so you can visually see when you excel and when you don’t. Often as beginners we are told to step with the opposite foot on a volley but I would like to elaborate on this concept. What should actually be happening is you are pushing off of the foot that is on the SAME side as the side the ball is coming to. For example if you are a right handed player and you are receiving a forehand volley, you will put your weight on your right foot so that you can push off and transfer your weight as you make contact. Yes, you will then land on your left foot, effectively taking a step. I think it’s easier to think, right side, load the right foot, than to think opposite. Lastly make sure that the “step foot” is coming down AFTER contact so that you haven’t finished the weight transfer before contact. Think, hit – step, versus, step – hit. Many experienced players have a good understanding of the technical and tactical parts of their tennis game. However, from experience I believe that a significantly fewer number of players focus on the mental aspect of the game. I find this interesting since the mental aspect of the game applies to literally every level and competitive belief. Even if you are not competitive, it still applies in some shape or form. That being said, there are three common types of thinkers; past, future and present. People who think in the past tend to get a little more upset, people who think in the future tend to be a little more anxious, especially under pressure, and people who think in the present tend to be a little calmer and collected. Your goal should be to think in the present, but I believe that is only the tip of the iceberg. That being said, it is psychologically difficult for the past and future not to affect our present actions. Thinking in the present is very difficult because everyone will be thinking of different things throughout a match, whether it be positive or negative. These different thoughts are like “white noise,” or background noise to a present thinker. I personally found it very difficult to not think about the past, and especially the future before and after matches. However, it was necessary for me to get past that in order for those thoughts not to affect the outcome of my matches. Consequently, I encourage you to deeply visualize your matches and even your practices before they happen. I recommend you go to the court and sit where the spectators would sit, and visualize yourself playing the match as yourself and also as playing the match as your opponent. What are your strengths and weaknesses? What are your opponent’s strengths and weaknesses? If I knew my opponent I found it important to figure out how much winning meant to him on a personal level, and imitate that during my visualization. This would help me go into matches with a greater intensity than his. Next, you will want to visualize the absolute “Nightmare” match against this opponent where you cannot get anything right and nothing you are doing is working. Think about the spectators and opponent being obnoxious, bad calls being made, someone’s dog barking on the sideline etc. In order to end the visualization process on a positive note, you will then want to visualize the absolute “Dream” match where your confidence is soaring and your strategy, and shots are flawless. Think of winning the match 6 - 0, 6 – 0, and what would it would look like/what would you need to do to accomplish this. The purpose of this is to put all outcomes on the table, while at the same time prepare the tactical and mental aspects of the match ahead. I believe that this visualization will greatly reduce the anxiety before and during matches for ALL types of thinkers, because it offers us a reference to all outcomes and how we accomplished each of those, as opposed to attempting to navigate through each of them as they are happening during the actual match. What Does Your Offhand Do on a Forehand? We spend a lot of time working on our swing and our feet but not a lot of focus goes into the hand that isn’t on the racquet. Ideally you want your hands and arms working together to maintain momentum through the ball and the follow through, as you rotate through the contact. Imagine you were standing in front of a table with a piece of paper on it. Your goal is to slide the paper off the table sideways with both hands, without crumpling it. For this to go well, both hands have to move at the same speed at the same time. Another visual is to pretend you have handcuffs on with a steel bar in between as opposed to a chain. This would allow you to slide the paper off the table relatively easily. To accomplish this with a tennis racquet on a forehand, take your off hand and reach it out towards your contact point. You won’t be able to reach it because you don’t have a racquet in that hand so you will be about two feet short. Start your swing and when your main hand is about shoulder width apart from your off hand, they should start to move and swing together. Maintain that shoulder width distance through the contact and into the follow through. As your swing goes over the shoulder, the left hand will almost catch the racquet as it goes back on it to return to ready position. The timing may vary slightly with your exact swing but practice and you should notice more energy going cleanly through the ball. There are many acceptable places to finish or follow through on your stroke. At the shoulder, at your pocket, and by your ear, to name a few. However, the finish is not as important as you might think. I’m sure you have heard coaches say “finish, finish, finish,” which is good at first, but does very little to impact to your stroke, and what the ball is doing/going. Contrary to popular belief, eventually the finish...ing point of your stroke will have no impact on what’s happening to the ball. The reason the finish does not impact your swing is because the ball is only on your strings for two milliseconds. Everything after the contact point doesn’t really matter because the ball is long gone before you get to any finishing point. Yes, even if you have fancy “spin” strings, the ball will not stay on your racket any longer. The strings “grabbing” the ball is just a myth. So, what is more important? Don’t get me wrong, finishing your strokes is a good thing, but you should not harp on it for a long time and think about simply “finishing.” The only reason “finishing” our strokes exist is because it the most natural place to stop the momentum of the racket. The reason you are taught to finish on your shoulder for a standard groundstroke rally ball is because it is the most natural place to finish the upward momentum generated by your swing. We don’t finish out in front of our body because that wouldn’t allow spin. Therefore, when all these points are considered we can conclude that everything leading up to the contact point is significantly more important than the finish of your stroke, and often overlooked. As a matter of fact, if you execute the proper bio-mechanics of the stroke leading up to your contact point, your finish should be effortless and take very little thought. By the same token, it should be very difficult for you to NOT finish. When I was on my journey of improving my tennis, consistency was the name of the game. Every time I practiced, my goal was to make sure I could repeat something to the point where I could always depend on it without thinking about it. For example, if I wanted to hit the ball deep cross-court, I practiced it hundred's of times until I was sure I could get the ball into the cross-court half, past the service line. I wasn't too concerned about how good the shot was as long as it was going to my desired location. From there I would slowly build up the quality of the shot, making sure I was keeping it consistent. I think this is where a lot of people go wrong in their practice approach. They are either trying to avoid doing something wrong or they are trying to practice too good of a shot. First of all, you never want to practice avoiding something. Always try to practice accomplishing something. So instead of trying not to miss, where you will tighten and lock up, try to relax and trust the ball will go where you are aiming. It's OK if it doesn't, remember you are practicing. For those trying to hit too good of a shot, try to slow it down and find a pace and swing speed that you can control while staying relaxed. Get to a point where you can hit the ball to one half or the other 20 times in a row. It may sound like a lot but, use a ball machine where you can eliminate variables. It is much easier to do off of the same ball that's coming at the same height and speed. You want to create a foundation where you know that you can hit the ball at a certain pace, as long as you relax and aren't under distress. From here you can build on this foundation. Don't try to increase your pace 100%. Start with 10-20%. Stay at that level until you can make 20 in a row repeatedly again. Now you have a new foundation that is better than the one you had before. Increase the pace a little bit more. You might need to start adding spin to help keep the ball in as your pace grows. If you want the quality of your shot to get better, build a sturdy foundation first. Then, slowly start raising the foundation. Good luck! You may have heard your coach tell you to “keep your eye on the ball” time and time again. Although this is important, especially at the early stages of learning the game – I strongly believe that training your optical impulses, should progressively take precedence in your tennis training regime. When speaking of optical impulses, I am referring to the anticipation analysis and reaction of your eyes that quickly sends signals to your brain and triggers a specifically trained reaction of the body. I find the “keep your eye on the ball” theory to be a pattern of inattention to detail within the coaching world, to a certain extent. This is due to the fact that a lot of coaches harp on this basic procedure so much that they fail to extrapolate and graduate their students from simply just “watching the ball.” To be perfectly honest, there are no great tennis players out there who actively watch the ball throughout the entire retrieval process. This has been proven to be extremely stressful not only for your eyes, but also creates a significant mental strain. If you were to hit 1,000 shots in a match (which is more than average,) the ball will only spend about 4 seconds on your strings (4 milliseconds at a time.) During these milliseconds if the angle of your racket is even an inch off, the flight pattern of the ball will change drastically. In other words, you should most certainly be tracking the ball, but that shouldn’t be your only focus – It is only one of the many, and for a miniscule amount of time. “To cope with these limitations, two significant studies (Braden and Bruns, 1977; Ford et al., 2002) suggested a shift of focus from the ball to the contact zone. According to them, concentration can be improved not only by watching the contact zone, but also by the fixation on this zone until the end of the follow-through. "Well what about Roger Federer? He looks at the ball for a really long time." The realistic answer to this question is that he is, but he really isn’t. By the time the ball has crossed the net, it can confidently be said that Federer has already gotten into position and started the reaction of his body. Additionally, if you look closely at the slow-motion video below you should be able to see that he takes his head off the ball and focuses in on the contact zone. He is no longer following the ball with his eyes. This is very common with the pros. Let it be clear that I am just using Federer as an example because of the blatantly emphasized focus he has before and after contact. He does not watch the ball leave because this is HUMANLY IMPOSSIBLE. No human can see the ball on contact during the 4 milliseconds it stays on the strings. It is for this very reason that you should not be watching the ball for too long. By shifting your focus to the contact zone, and how you will get your body in position and racket into the proper contact zone you will increase your concentration, control, and reduce stress and anxiety. These benefits happen naturally by allowing the body to focus on reacting instinctually to the task at hand, instead of stressing yourself to keep your eye on the ball. Just because you cannot see this, does not mean you cannot control it. It’s actually the opposite. Hear me out when I say that it’s not about focus on the tennis court. It’s about the ability to refocus over and over again, for every shot during every point. Think about driving. It’s just another day in the neighborhood, there’s light traffic and out of nowhere a deer runs out onto the road. Some people might run the deer over, but most people will swerve out of the way without thinking to avoid the deer. Either way, some sort of instincts come into play. That takes a little bit of focus there, but afterwards you have to refocus right away. Did you hit the deer? Do you need to pull over? Is your car ok? Is everyone who was around me ok? Imagine all the stress and anxiety these thoughts are causing. Any normal person would probably freak out a little, which is understandable on many levels. However, instead of focusing on all the different potentialities the best thing to do here mentally is to take everything one at a time (just like every shot as its own) and re-focus yourself on finding a safe place to pull over and assess what actually happened. If you don’t re-focus, the risk of you getting in an accident, car being damaged more etc. will increase. By the same token, think about how stressful it would be to drive and be constantly looking everywhere for a deer to pop out. Now in reference to the instincts at play here, a person who lives where there are a lot of deer will probably respond a little better/quicker than a person who’s never experienced a deer running in the road before. This is because they have “practiced” or trained their reactions both mentally and physically. Their eyes can tell a little sooner that a deer is running on the road, and it’s not just a really big pigeon. This same concept applies to training for tennis. That’s all I have for my deer analogy, I promise! Conclusion: In retrospect, I would like you to associate my treasured deer analogy to what we tennis players call “great hands,” or “quick hands.” This is when a player gets a shot nailed right at him/her and they just react, putting their racket in the right place at the right time without consciously thinking about it. Everyone has experienced this at least once or twice playing tennis. Therefore proving just how important your optical impulses really are. If on one end you train the physical response aspect of technique, and the other end responding efficiently to various optical queues, your performance will sky rocket. Imagine expanding those “quick hand” moments to every stoke! Before I begin, I would like you to take a moment to understand the importance of “personalized” expert insight. “Many resources offer insight into how to perfect your technique, but nothing can replace an expert analysis of your particular style. Work with a qualified coach who can dissect your performance and point out your flaws as you’re more unlikely not to be able to see them” (Mack, 2012). No doubt I am a big fan of online articles, videos and books, but I cannot stress enough that everyone is different on the tennis court. There are of course generalized universal truths in tennis, but players learn differently, some are more coordinated than others, some have past injuries that still haunt them, and not to mention everyone has different goals. All of these things are great, but yet again each one takes a little different approach. Regardless, improvement is possible! Everyone can achieve the same results, but the path you take to reach them may take different approaches, and more or less time than the next person. I am a strong believer in “personalizing” the learning process. If you are truly looking to enhance your performance, I encourage you to seek out a coach who can add a personal touch in your tennis development and assist in achieving the best stroke biomechanics and production. As far as generating power goes, everyone wants it and I hear it all the time. “I want more power!” Usually my answer to this gets looks of disappointment. What I say most of the time is, “well it takes time, and we must focus on technique, accuracy and movement first. After we get a solid foundation of those things, only then should we focus on power and it will usually start to come naturally. Power can sometimes take away from a plethora of other learning topics, like control, strategy and WHEN to use your power etc.” There are no pros who are hitting with all their might on every shot, and as a matter of fact they are generating most of their power with minimal effort. Furthermore, the reason pros are able to do this is because of their off-court training exercises (you can do them on court too.) In other words, the more strength, flexibility and coordination you have, the less energy you will be using throughout matches, and a smaller percentage of muscle strength will be required for each shot. Off court routines will also decrease your risk of injury. Remember, I am not saying that you have to be doing the same routines as the pros. What you do will depend on your goals. The four main power generators are your legs, body rotation (Emphasis on hips and shoulders), racket speed (Emphasis on timing & relaxation), and pre-stretching of muscles. The pre-stretching of the muscles and the “kinetic chain” from the ground up is arguably the most important aspect of generating power. The pre-stretching of the muscles is basically a stretch of the muscles on the backswing and a shortening of the muscles on the forward swing, like a slingshot. Even if you can achieve this stretch and shortening of the muscles, if you do not have the timing down, then it won’t be nearly as effective in generating more pace. This week I will go over the pre-stretching of the forehand groundstroke and in weeks to come I will introduce other strokes. Check out the picture of Nadal to the right and notice that his shoulders are rotated past his hips, and his left leg is firmly “loaded” with his center of mass leveled on top of the loading leg (left.) Also notice how his right leg is not even fully on the ground. This is the stretching of the muscles. Therefore, he is actively storing the energy of his muscles and is getting ready to release and shorten the muscles during the unloading faze of his shot. Lastly, the timing of this pre-stretching is crucial in generating power. If timed correctly this will add 20% more racket speed to your shot. However, if any delay occurs between the backswing and forward swing, 50% of any power/racket speed generating effects will be lost. Lastly, it is commonly taught to “prepare the racket early,” which is great at the beginning stages of tennis but detrimental to your strokes in the long run. While practicing on the ball machine or just practicing in general, I encourage you to shorten the delay between your racket preparation, backswing and forward swing before hitting the ball. Not only will this help you focus more on other things like foot placement, I am confident that you will start to see minor improvements to your power and racket speed. Welcome to Oro Valley, AZ where the sun is always right in your face. Be that as it may, tennis players must learn how to play in many weather conditions. This can make things difficult for players not willing to adapt accordingly. Differing weather conditions and virtually unquantifiable variables are simply a part of tennis. That being said, this week’s tip will offer a few solutions to one very big and bright variable that affects the most important shot in tennis, the serve. As a player, I can definitely relate to the unpleasantness of serving into the sun. Moreover, my willingness to figure out solutions to common challenges that may threaten my chances of winning EVERY SINGLE service game is something that has been key to my serve over the years. It was simply not an option for me to lose my service games. This “key” I am talking about is simply the formulation of dynamic service motions, stances and tosses. Moreover, if you are a player with one service stance & toss then you will inevitably have a difficult time adjusting in certain situations. #2. Drop Serve. Yes, seriously. If the sun were really bothering you then I would think about employing this tactic. It gets the ball in play and there is virtually no chance you will look into the sun. #3. Use your hand to block the sun. This usually works a little better on the overhead, but sometimes all players’ need is to hold their non-hitting arm up a little longer than usual. This is similar to dropping the visor in your car when you are driving. #4. Avert the focus of your eyes. Just like if you were driving into the sunset. One option is to use the marked lines on the road to help guide you in the right direction. The same concept applies to the serve. This will definitely take some personalization in terms of where you will want to focus, but as long as your timing is consistent this solution could be a great choice. #5. Invest in some high quality polarized sunglasses. This may seem very obvious, but if all else fails I would give this option some consideration. I personally cannot play tennis in sunglasses. This is a very basic and watered down explanation of dynamic service motions, stances and tosses, but I hope it opens up new opportunities to expand your tennis game. Every day I see players with solid execution of their shots. I also see these same players lose a significant amount of points because they are in the wrong position. Not usually on the first ball, but the second or third ball of points. This scenario usually consists of players either not moving, or moving to a point of no return. Therefore, lowering the percentage of points that they win in these situations. Generically speaking, most players have the right idea when it comes to where and what they should be doing when hitting certain shots. However, they frequently forget to “reset” and maintain continuous movement. The reason this is so very important is because of the limitless variables that tennis can offer. Imagine a game of chess where you must make your next move within a second, or you lose your move. Tennis is like a constant cat and mouse game and the quote, “The best-laid plans by mice and men often go astray” couldn’t explain the game better. In other words, you have to be versatile in your executions of different shots and strategies. Let’s say you learned your lesson from the last point, and this time you are going to play it safe. You know you need to come in attack this opponent, as they are more consistent than you. So this time you come in off an approach shot again, and decide not to close in as far because your opponent has good lobs. You hit a volley or two and then BOOM! Your opponent hits it right at your feet forcing you to pick the ball up, and takes it out of the air for a winner. (You didn’t trust your shots and positioning in this situation. Definitely move forward against these players, but be mindful of the one you choose to close in on. After that, make sure you reset.) ALWAYS expect the ball to come back! Of course there are endless scenarios I could make up about this, but you get the point. The player I made up cannot be beaten! All jokes aside, my point is that there is always a statistically proven position to be on the court after every shot that will maximize your chances of winning that point. I am not saying you will win every point that you get in the proper position, but you will certainly increase your chances. I could go on all day about this, but here is my conclusion. Different coaches may split the court differently, but I split the court into 8-10 zones depending on a couple different factors, but for now I’ll give you three to think about. The first three zones are at the net and they will horizontally split the service boxes into thirds. The first is at the service line, the defensive zone. The second is in the middle of the box (neutral/looking to attack.) The third is in the front third of the box (point finishing/poaching.) Believe it or not, you will hit 70% of your volleys in the service line zone (zone 1.) Basically, you will want to move forward a zone if you hit a good volley, and backwards if you hit a bad volley. This happens with a forward split step, or backward split step, not just a charge or a retreat. You should NEVER stay in the finishing zone (zone 3) for more than one ball. Ideally you will want to be in a constant rhythm of movement throughout all of these zones, each and every point. This week I want to talk about how we look at our own performances in practice and matches. Specifically I want to focus on the type of person who is always dissatisfied and highly critical of themselves. For some reason it makes me think of the movie Liar Liar with Jim Carrey. There is a seen where he is in his office punching himself in the face and throwing himself into cabinets for the purpose of showing that he has been obviously physically harmed to a court judge. Someone walks in on him and asks what is going on and he says, “I'm kicking my own 'bleep,' do you mind!?!! ?” While this is comical in a movie, it seems that many people are doing this to themselves mentally all the time. In some ways it's good to be overly critical of yourself because it's going to keep you striving to improve. At the same time it's bad to be constantly evaluating your performance. Often if you are working on some aspect of your game, another aspect is going to decline for the moment. For example, let's say you are focusing on keeping your left hand up on your serve. For a while the timing of the swinging arm can falter. After some time though they will meld together. If you are upset with yourself because you were missing while keeping the left arm up, you are less likely to continue to do it during practice and matches, which increases the amount of time to fit that process into your game. So don't get upset, just keep working at it and don't worry about the result in the short term. If you are going to evaluate anything, let it just be the one thing you are trying to get right. Another thing that can occur from too much evaluation is over-correcting or correcting the wrong thing. I often say we shouldn't really focus on our technique in matches, but sometimes you have to if you are trying to solidify something you have been working on, especially if you really want to translate that practice into matches. You have to make sure you are only focusing on one thing though and not worrying about weather it's working or not, only weather you are doing it or not. For example let's say you are focusing on following through more because you can do it in practice just great but tighten up in matches. Everything is going fine but then at 3-3 you miss 3 forehands in a row and lose the game. You think you were following through so something else may be wrong. Something else probably was wrong but you can't worry about it because if you do, things can snowball. If you start focusing on all these things you should change to fix your shot at 3-4, it's probably only going to get worse. So just keep following through and see what happens. Here is the most important concept. Most of the time techniques are learned relatively quickly, it's the timing and positioning that then has to be adjusted to fit the techniques. If something you have practiced is in place for the most part and all you are working on is timing and positioning, that is a great place to be. That is what you want. Keep practicing. Most of the time at 3-3 those 3 forehands you missed were probably because of bad timing or bad positioning or both. If you go thinking something was wrong with your swing because you are a “constant evaluator,” you are going to start trying to fix something that isn't broken. Don't change anything. Don't beat yourself up. Just keep going with what you are working on knowing you are giving yourself the best chance to succeed! Can I buy a Clue? This week I want to talk about what happens during the 50% of the time in a point where you are not setting up and hitting your shot. Your shot is going to your opponent’s side of the court. They are moving towards it getting ready to hit the ball back. Obviously you should be moving into your recovery spot and getting ready to split step. But what else? There are all sorts of clues that your opponent may give you as to what kind of shot they are going to hit and where they might hit it. If all you are doing at this time is watching the ball travel, instead of watching your opponent, you are missing out on tons of valuable information. 1. The racquet preparation. Watching how a person is preparing their racquet is vital. If they are taking it back and then dropping it below the contact zone, they are probably going to hit topspin. If they switch to a continental grip, and/or start their racquet above the contact zone, there is a good chance it will be some kind of slice. Knowing what spin they put on the ball can help you judge the right position you need during the setup for your next shot. Also in doubles you might realize it’s a good time to poach if they are slicing since slices tend to float and travel slower than drives. If they open their face before they start their forward swing, you know it will be a lob. You can get a head start on your turning and moving backward. 2. Distance to the ball. You should be able to get an idea if your opponent is going to be able to set up balanced or still be on the run. Will the ball be in their contact zone or will they have to reach for it. If it seems they will be on the run or having to reach for the ball you can expect a weaker shot back and prepare accordingly. Be ready to move forward. Chances are you will want to hit an approach shot, take the ball out of the air or finish the point off entirely depending on where you are in the point. If it seems they are going to hit the ball late, you can likely rule out the chance of them hitting the ball crosscourt effectively, so give extra coverage to the line. 3. Stance and set up. Watch how your opponent sets up. Are their hips and shoulders turned? Is their stance opened or closed? Most of the time, if a person sets up too open or if they open early, they won’t be able to hit down the line effectively. Their range of motion through the ball is now shorter so while they may be able to go down the line still, it will be weaker and less accurate than usual. This means you can hedge your coverage crosscourt. 4. The eyes. If an opponent looks up to see where they are aiming, it’s pretty likely that’s where they are aiming. These examples are certainly not rules you can count on every time, there are always exceptions. Some people can come up with amazing shots regardless. This is also just a small sample of the multitude of information you can gather. The point is, you can hedge your bets and have quicker jump on the situation if you are watching your opponent after your shot and not the ball. Good luck! I see a lot of players hit a wall and plateau when it comes to being able to vary the depth of their shot. You learn to hit it straight. Then you learn to hit it harder and deeper. Now it’s time to really start enhancing your transition game to the net but you keep hitting it long. You want to start hitting the ball to someone’s feet as they are coming in but it’s always sitting up or going in the net. You want to be able to hit angles but it seems like you can’t. These are all depth issues. The most common cause of this problem that I see is that players are over practicing hitting deep from behind the baseline compared to everything else. If you are trying to hit the ball 2 feet inside the baseline, and you are standing 2 feet behind your own baseline, the ball has to travel almost 80 feet. Now if you have to move forward 10 feet to hit an approach shot, and you use your 80 foot shot that you have been practicing so much, the ball is going to be 8 feet out. This is what I call the Shot Depth Availability. In the previous scenario, you only have 70 feet of available depth to make the shot. So start practicing hitting balls 70 feet too. Practice 60 and 50 and 40 foot shots as well. To highlight the other examples, let’s say you are playing someone that is serving and volleying. Your regular 80 foot return is now an easy, waist to chest high volley for them. If you want to be able to put it at their feet, you need to be able to hit a ball that only travels 60 to 65 feet. If you want to hit an angle, the sideline is now the baseline in terms of depth. The distance from your racquet to the spot where you can safely land the ball inside the sideline may only be 40 feet. Whether you use topspin for control or not, the point is, you need to be practicing shots from varying depths. Practice hitting to one spot from different places on your own side of the court, but also practice hitting different depths from the same place as well. Power is great but there are lots of times where placing the ball with the appropriate depth can be a much tougher shot for your opponent than just a powerful one. The Three Times to Approach. Coming to the net can be tricky. Often when we start practicing coming to the net, we make mistakes regarding the situation or shot selection and thus lose confidence right away in the process. Just like everything else in tennis, recognizing when to come in and knowing what shot to hit takes a lot of practice with trial and error. I'm going to outline the 3 common times to come in from a singles perspective but most of the information can be applied to doubles situations as well. This is when your opponent hits a ball very short whether by accident or on purpose. When you get in position to hit the ball you will be closer to the service line than you are to the base line. This is the best time to start practicing coming to the net because you are actually closer to recovering to a good net position than recovering to a good baseline position. If you try to retreat, you most likely won't make it back to the baseline by the time your opponent is hitting the ball and thus you are making yourself vulnerable to a deep shot at your feet. Since retreating is a worse alternative, you might as well just bite the bullet and get in good net position if nothing else for the practice. As your understanding of net position increases, combined with your ability to aim your approach shot, you will start to make planned approaches. You will start to look for a ball somewhat within the middle half of the court that you can hit from inside the baseline. It might not be so short that you are forced to come in, but you recognize it as an opportunity to attack your opponent. The goal here is to be able to hit a high percentage ball that puts you in good net position while forcing your opponent to hit a ball off balance or on the run. As you become more proficient in this process you will win this scenario 60-75% of the time and begin to better recognize when the opportunity presents itself. Any scenario that you are creating in tennis with that type of success rate is one you want to repeat and take advantage of whenever possible. A reactive approach is one I see people do wrong quite often. You have hit a great shot and then realize a moment later that you should go to net to take advantage of the likely weak return. What happens though, is that in the process of coming in, you are horribly out of position because of your late reaction. Now the opponent's weak shot becomes a perfect shot at the feet or worse, and you are trying to reconcile the situation while being off balance and out of position. Usually when you hit a great shot but you weren't expecting it to be that great, it's best to wait for the next shot to come to net. Get right up on the baseline, be ready to explode forward, but don't commit to coming in until you see your opponent's response. If it's short, attack it quickly and approach to the open court. If it's a high defensive shot, you can move forward and volley it out of the air as a volley approach to take away your opponent's recovery time. However it turns out, you won't get caught off guard and squander your great shot.